Vodka is not just for cocktails anymore! If you have a bottle of vodka in your cabinet that you just can’t seem to finish, you would be surprised how many uses for vodka there is that benefit your household! 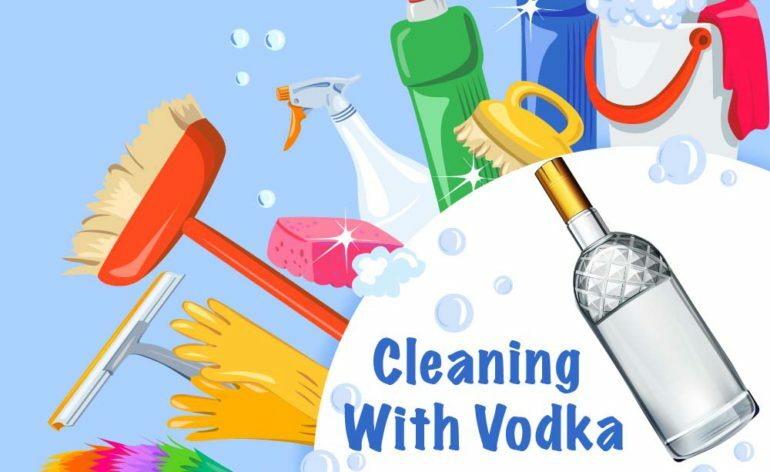 Maybe you would like to learn how to clean with vodka? Homemade DIY cleaning products have become more popular than ever. Using cleaning solutions you have mixed yourself is highly economical, not to mention it is beneficial for your health and the environment. Reducing your exposure to chemicals does not mean you should compromise a clean home! Most noteworthy, vodka is a non-toxic sterilizing solution. Vodka is the potent household cleaner likely already in your house. Consequently, vodka works in a similar fashion to vinegar: it removes stains, refreshes fabric, disinfects, and neutralizes odors. It is wonderful for anyone sensitive to chemicals, or looking for natural cleaning solutions. Therefore, try these 10 recommended cleaning methods for yourself. You will be surprised by the benefits vodka can provide besides simply taking a shot! A simple solution transforms vodka into a powerful surface cleaner. Check out this formula that works wonders cleaning kitchens and bathroom surfaces. Mix all of these ingredients together to make your own vodka surface cleaner. You are sure to be impressed with the performance of this simple to make vodka cleaning solution. So, do you have any hard to clean greasy spaces, such as range hoods countertops, or pots and pans? Vodka will help you. Try a 1:1 vodka water solution to soak the affected area, either with a spray bottle or a moistened sponge. Hard to clean pots and dishes clean much faster if you add a splash or two of vodka in a sink full of soapy water. As a result, you will never have to spend hours scrubbing these surfaces again! Vodka is a strong solvent that is often used to remove a wide variety of stains from materials like carpet and clothing. If you have a shirt that is covered in a hard to remove stain like wine or lipstick, try blotting the garment with a vodka-soaked rag or sponge. Rinse the clothing and repeat until the stain has disappeared. If you inevitably spill something on your carpet, vodka can save the day! Spray the stain with pure vodka and blot with a cloth. Repeat with a clean cloth and let the stain dry. The stain should be removed. If someone in your household has perpetually stinky feet, spraying vodka will quickly disinfect and get rid of the smell. Try spraying shoes with a spray bottle or rub down with a soaked cotton ball to neutralize lingering smells. Additionally, this method also works for couches and household rooms that absorb odors from pets, foods, or smoke. Try mixing a bottle of 1:1 vodka water solution with essential oils and orange peel for a refreshing citrus scent that diminishes lingering unpleasant scents! If your towels are feeling and smelling musty and moldy, try adding 1/3 cup of vodka in your washing machine when It is filling up with water. Then add laundry soap, and pause the machine when it is full of the water-soap-vodka solution. Finally, place your towels into the filled machine and let them soak for at least an hour before running your washer. A long soak will get rid of any lingering scents and your towels will feel and smell fresher than ever before. Dealing with lingering pests surrounding your houseplants can be very annoying. Wash your houseplant leaves with water and dab with a vodka soaked cotton ball to keep insects like aphids at bay. It is recommended to try this on thick and waxy plants due the possibility of delicate plants being damaged. Vodka always works wonders for keeping ants out of the house! Simply spraying vodka along the perimeter of ant trails immediately deters the ants to a new path! Vodka is a great non-toxic cleaner for jewelry, beads, and other trinkets. Add your pieces to a bowl of vodka and swish them around to clean the entire surface area thoroughly. You can soak very dirty jewelry and use a toothbrush for more refined and detailed cleaning. It is best to avoid cleaning soft metals or delicate jewelry like opal and pearls to avoid damage. While you might have never thought of pouring vodka into your bed sheets, you will be happy you did! This fresh sheets solution will keep your linens refreshed and smelling amazing. This solution also works well on towels to keep them fresh and smelling clean. Mix the solution below into a spray bottle and store, and you will always be ready to give your linens a quick and necessary refresher! Vodka is incredibly useful for reducing or eliminating rusting. Directly applying a clean cloth saturated with pure vodka can clean engine parts, tools, razors, and anything else that is susceptible to rusting. As a result, expand the life of your household items for much longer by treating them with vodka! Furthermore, these easy, cheap, and highly effective DIY cleaning solutions will change your cleaning routine forever! Why spend all your money on expensive and chemical laden products? The most effective cleaning solution is likely already in your liquor cabinet. In conclusion, the benefits of cleaning with vodka are too good to be true. You are keeping your home clean of germs and bacteria, while protecting your health and the environment! If you are feeling cheeky- why not have a drink or two while you clean? Most of all vodka is truly the most versatile cleaning product you have used yet! We hope you have enjoyed learning new methods of how to clean with vodka.